499 Park Avenue is pleased to present an exhibition of recent work by painter John Walker. Running from September 26, 2018 - March 20, 2019, the exhibition features seven new oil paintings created over the last two years. Located on the southeast corner of 59th street and Park Avenue, the opening reception will be held on Wednesday, September 26 from 5 - 7 PM. The show is open to the public 9 AM – 5 PM, Monday through Friday, and is accompanied by a color brochure featuring an essay by Karin Wilkin. John Walker studied at the Birmingham College of Art and La Grande Cheumiere in Paris, and taught at the Victoria College of the Arts in Melbourne, Australia, before moving to the United States in 1969. Walker represented the United Kingdom at the 1972 Venice Biennale and his work is in many major museum collections around the world. From 1993 to 2015 he taught painting at Boston University's School of Visual Arts and during his tenure served as the head of the graduate program. John Walker is represented by Alexandre Gallery, New York. 527 Madison Avenue is pleased to announce an exhibition of paintings by Brad Marshall in the Lobby Gallery from September 6 – November 16, 2018. Located at 54th Street and Madison Avenue, the show is open to the public 9 AM – 5 PM, Monday through Friday, and the opening reception will be held on Thursday, September 13 from 5 – 7 PM. This will be the fourteenth exhibition in 527 Madison’s ongoing program showcasing noteworthy emerging and mid-career artists. The exhibition will feature eight oils which depict views of New York City (where the artist is based) as well as landscapes from the artist’s travels. Similar to nineteenth-century Hudson River School painters, Marshall is attracted to dramatic locations and his work reflects his emotional response to his subject matter. Brad Marshall studied at the San Francisco Academy of Art and his work is in a number of public collections including the Hudson River Museum of Art, the General Electric and Commerce Bancshares Collections. He is represented by the Fischbach Gallery, New York/Miami. The June 5th panel discussion was a great time and tremendous success. Thank you to all those who were able to join us at 375 Hudson. For those of you who were unable to join us this page will discuss some of the highlights from the conversation, and you can view the full video below. Jay Grimm introduction the panel speakers: (left to right) Tricia Bloom, Donald Kuspit, and Matthew Deleget. The panel began with presentations by Tricia Bloom who showed works from the Newark Museum's collection that relate to Robert Swain's work. Moderator Matthew Deleget then spoke about Bob's life and career. Donald Kuspit then took the floor and introduced numerous ideas ranging from the debate between Goethe and Isaac Newton about how color is perceived to more recent thoughts on color by critic Clement Greenberg. Questions followed, including a few excellent insights from people who pass through the lobby on a daily basis on their way to their office. Tricia Bloom presenting her presentation on contemporary art that resonate with Robert Swain's current work. 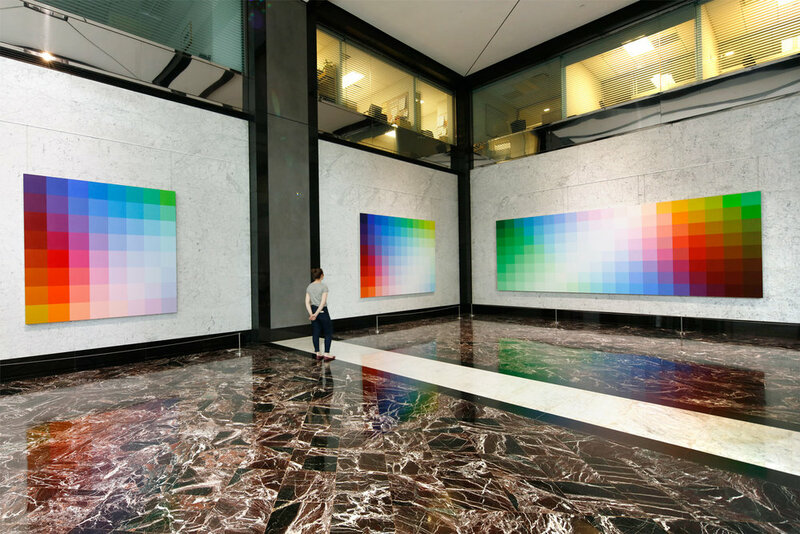 450 Park Avenue is proud to present works by New York artist Oona Ratcliffe in the lobby gallery from July 17 – October 19, 2018. An evening reception and walkthrough of the exhibition led by the artist will be held for tenants of 450 Park Avenue on August 9, 2018 from 5 – 7 PM. This is the fifth show the building has mounted as part of its new program of rotating exhibitions of contemporary art. Brooklyn-based artist Oona Ratcliffe uses vibrant color and combines hundreds of small shapes to create paintings of great visual impact. Ratcliffe holds a BFA from the University of California, Santa Cruz and an MFA from Hunter College. In addition to numerous solo and group shows in New York and California, she has done a residency at the Yaddo artist’s community in Saratoga Springs, New York and was awarded a travel grant by Hunter College which she used to study art at the Ecole de Louvre, Paris. 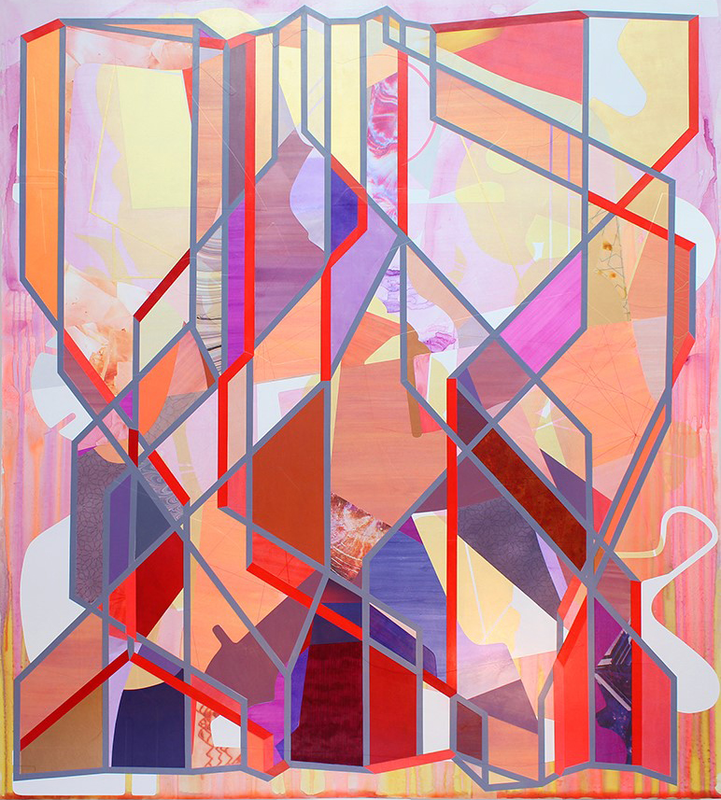 Apres Flash (2018) by Oona Ratcliffe, acrylic on canvas, 52x40"
I am proud to have co-curated "Robert Swain: Syntax", which was installed last weekend in the large atrium at 375 Hudson Street. Swain, one of the foremost color theorists at work today has been a practicing artist since the 1960s and is known for his large-scale paintings which explore and explicate his findings. He has created six large-scale works specifically for the space. A color brochure with an essay by Matthew Deleget, founder of MINUS Space in Dumbo accompanies the show; my co-curator is Lenore Goldberg of Hines Management, who sponsored the exhibition along with Hudson Square Properties, LLC. An opening reception will be held at 375 Hudson (just below Houston in west SoHo) on Tuesday, May 22 from 5 - 7 PM. I have organized a panel discussion on June 5th, starting at 5:30 PM about the work, which will feature critic Donald Kuspit and curator Tricia Bloom of the Newark Museum, moderated by Matthew Deleget. Please join me and artist Aaron Wexler as we celebrate the opening of his show at the 527 Madison Avenue Lobby Gallery from May 16 – August 24, 2018. Aaron Wexler creates collages of great visual complexity using a variety of sources. While much of his work is made from paper that he has himself painted and cut into shapes, the artist also uses commercially printed patterns,images from books, photographs and a wide range of other material in his collages. Wexler’s shapes are arrangedon a sophisticated internal structure that calls to mind systems of organization used in typography. Mixing hard edges and painterly areas with intertwined lines, Wexler arrives at works that resonate on many levels. Located at 54th Street and Madison Avenue, the show is open to the public 9 AM – 5 PM, Monday through Friday. The reception will be held in the lobby from 5 PM - 7 PM at 527 Madison Avenue. This will be the thirteenth exhibition in 527 Madison’s ongoing program showcasing noteworthy emerging and mid-career artists.